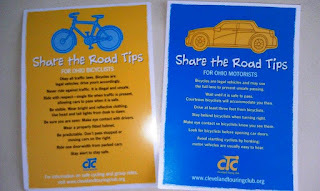 We are grateful to the Cleveland Touring Club (www.clevelandtouringclub.org) for putting together what we think is one of the best Share The Road handouts we've ever seen -- AND for providing with us a supply to hand out at all three Century Cycles stores! 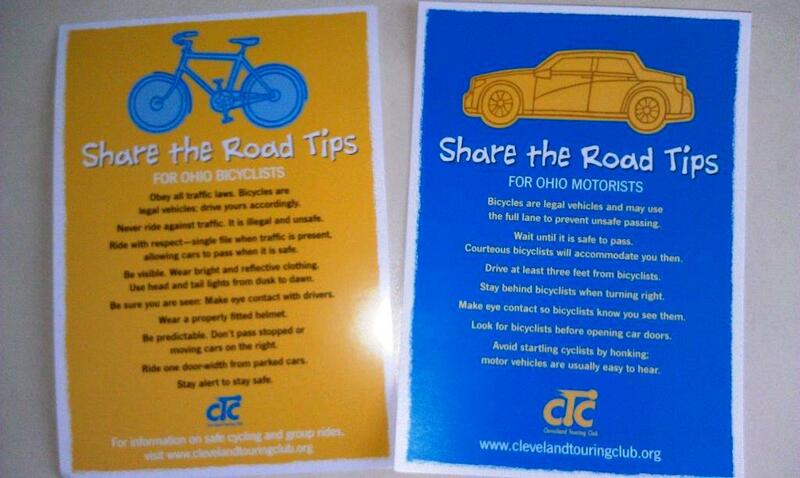 The postcard has tips for Ohio bicyclists on one side, tips for Ohio motorists on the other, with a good dose of mutual respect all around. Obey all traffic laws. Bicycles are legal vehicles; drive yours accordingly. Never ride against traffic. It is illegal and unsafe. Ride with respect -- single file when traffic is present, allowing cars to pass when it is safe. Be visible. Wear bright and reflective clothing. Use head and tail lights from dusk to dawn. Be sure you are see: Make eye contact with drivers. Be predictable. Don't pass stopped or moving cars on the right. Ride one door-width from parked cars. Stay alert to stay safe. Bicycles are legal vehicles and may use the full lane to prevent unsafe passing. Wait until it is safe to pass. Courteous bicyclists will accomodate you then. Drive at least three feet from bicyclists. Stay behind bicyclists when turning right. Make eye contact so bicyclists know you see them. Look for bicyclists before opening car doors. Avoid startling bicyclists by honking. Motor vehicles are usually easy to hear.